Both SIA and our member companies are committed to making positive contributions to the communities where we live and work. 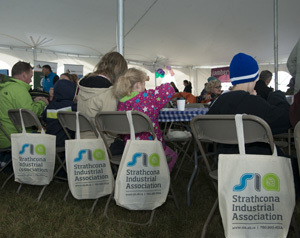 River Day — SIA hosts the pancake breakfast at the City of Edmonton’s annual River Day event in June at the Rundle Park Family Centre. It’s an event that brings the community together as they learn more about North Saskatchewan River recreational water safety. United Way’s Day of Caring events – Many of our member companies participate in the United Way’s Day of Caring events. These events fund local social welfare agencies including; Edmonton Food Bank, Hope Mission, the Mustard Seed Homeless Connect Edmonton and KARA Family Resource Centre. SIA is excited to announce that we have reduced your Christmas lunch load by one event as we move our annual Stakeholder lunch. SIA will not accept phone calls from anonymous or blocked calls. Please unblock your number before dialing.